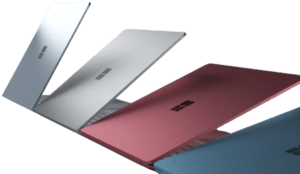 Home → Business/Professional Laptops → Is The Surface Laptop Going To Break The Bank? Well, we are all well underway now and cruising nicely into 2018. There were so many nice laptops in 2017 that it is hard to remember them all, but I certainly remember Microsoft’s Surface Laptop. I especially remember that it is expensive in certain configurations. Today, I am going to discuss whether or not it’s too expensive for the value. When this thing launched a lot of people were very excited about it because it looks really cool. However, when the price was revealed people were a little bit disappointed because it seemed to be a little bit more expensive than it should have been. Now, it’s a Surface device, and the entire Surface series has always been a bit more expensive. It’s a more premium product line so it’s to be expected to run a bit more. 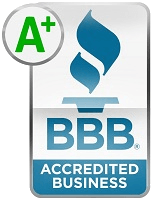 If you take a look at the build quality you will see that the exterior build quality is fantastic. Some may even say that the fit and finish of this laptop is comparable to Apple’s MacBook series. It has a better finish than the XPS 13. It’s a better finish than the Razer Blade Stealth and better than HP and Lenovo. It literally has the best build quality on any Windows laptop that I’ve seen to date, for this 13-inch screen size. The hinge feels well tuned and is durable. You can open the lid with one hand really easily and it has this really satisfying snap when it closes. The exhaust is well machined. It feels really precise. The entire laptop is made of aluminum, not magnesium like some other Surface products. The interior build quality is different. It’s good, it’s just not as impressive. 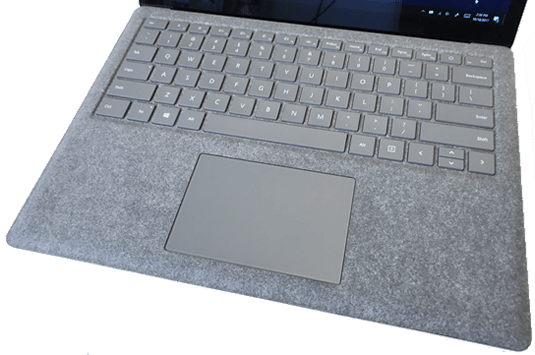 The palm deck material is Alcantara, it feels awesome, it’s really nice to the touch and the material is adhered to the laptop really well. Like I mentioned in another post, we will have to see how it holds up over time. We know for sure that it will get dirty, but just how bad will it be? Only time will tell. 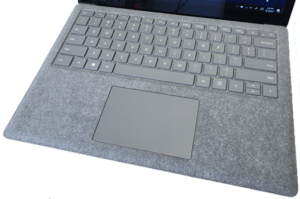 It does feel a bit different from the Alcantara Surface Pro keyboard, so hopefully, it is more resistant to wear and tear. The keyboard itself feels really good, it’s no perfect. There’s some flex from the keyboard deck that I wasn’t expecting. It’s supposed to have a unibody construction, so I thought it would just feel a little more rigid. I do enjoy typing on it, it’s just the interior build quality isn’t as good as its exterior build quality. The trackpad is also really nice with a glass surface and precision drivers. Surface trackpads have always done well, and this one is up to par as expected. 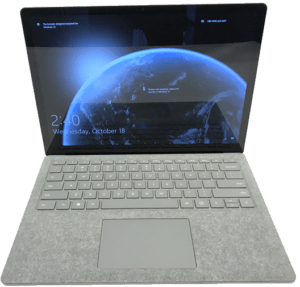 The trackpad and typing experience feel oddly similar to the Surface Pro experience. 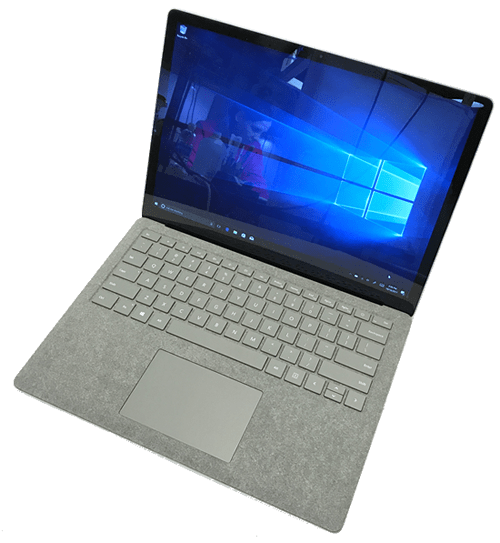 That’s kind of weird because the Surface Pro is a type pad cover and the Surface laptop is a regular fold-out laptop keyboard. It’s good, it’s just not as good as I was hoping to be. 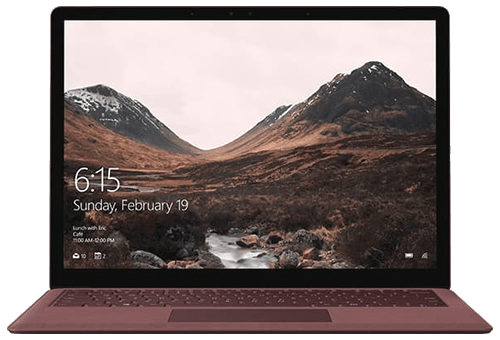 In terms of the operating system, Windows 10S, the slower version of Windows 10, is not an optimum platform for the best technology. I don’t hate it, and I think there will be some great benefits to the 10S for certain users, but if you want the better platform just go ahead and get the free upgrade to Windows 10 Pro. At 320 nits and a sRGB and Adobe RGB of 99% and 76% respectively, the screen is good. Color accuracy seems pretty good and it’s well bright enough. It is super glossy, however, so you won’t really enjoy using this outside much. The webcam supports Windows Hello, so you can log in with your face. The drive speeds were not as expected. During Microsoft’s presentation, they mentioned that they were using an onboard SSD system. The SSDs were made right onto the motherboard to provide better power efficiency and better speeds. They are using Toshiba drives and they are pretty powerful especially for the smaller drive. Read speeds aren’t bad, and the smaller capacity drives are slower; however, the write speeds are really disappointing to say the least. The 128GB drive in particular only writes at 130MB/s. It’s not that the write speeds are super terrible, it’s just that for something that launched in mid-2017, you’d want something a bit faster. This laptop is not designed for everyone. There are plenty of laptops out there that are geared for everyone, but this laptop is not. It’s geared for someone that’s looking for really good build quality and a unique aesthetic, and I think on that hand they nailed it. But the questions is whether or not it’s worth it. This is where it gets a little bit confusing. 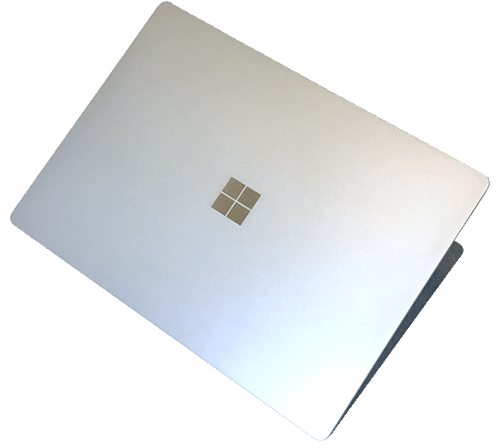 Microsoft launched this thing at the base (i5 128GB 4GB RAM) model for $1,000 USD, which on paper a $1,000 for a brand new Microsoft Surface laptop doesn’t seem that bad, and then you look at the specs, and you think to yourself, this seems a bit expensive when comparing this $1,000 base model to the competitors. It just doesn’t seem like a very compelling purchase. It’s made well, and it looks super cool, but the specs just aren’t there. Unless you have a really undemanding workflow, 4GB of RAM and 128GB of storage is going to feel anemic, to say the least. The mid-tier model (15 256GB 8GB RAM) is priced at $1,300 is the good one. I am sure Microsoft knows this and that’s going to sell the best. An indicator of this is that this mid-tier model comes in all of the different colors, and it’s priced the most competitively when comparing pricing. The i7 models are nice, and are better performers, but I just don’t think they have the best dollar to value ratio. 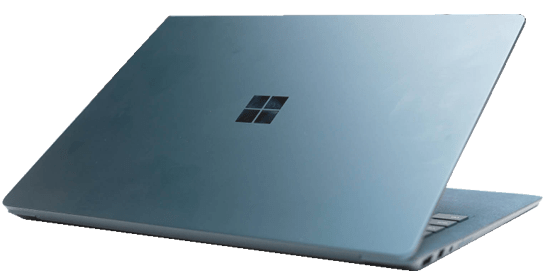 There’s still a premium to be paid for the Microsoft Surface branding, but it’s a more comparable value to its competitors, and at that mid-tier configuration I think it is worth it because you’re ridiculously good build quality, and if you happen to have an educational discount it gets even better.